I wanted to make a lower sugar version of a cookie for my kids' breakfasts and snacks. This is what I came up with. It's pretty tasty. I made these for my OAMC and now we can eat them all month long. YUM! In a mixing bowl, combine butter, honey, eggs, pumpkin, vanilla and stir well. Add oats and stir until combined. Let sit for 5 minutes. In separate bowl, sift flour, soda, salt, and spices. Add the flour mixture to the pumpkin mixture. Stir to combine. Add cranberries and combine well. Use a large scoop and scoop onto baking sheet sprayed with non-stick cooking spray. Press the tops down slightly to flatten the cookie. Bake at 350 degrees F for 15-18 minutes. This makes 17-18 large cookies. These freeze great. I also made some using the butterscotch chips from the original recipe, but it was way too sweet for me; especially first thing in the morning. But you change it up to suit your family. That's what recipes are for! I'm so excited that it's the time of year to incorporate pumpkin flavors into my cooking! These sound hearty and tasty!! Yes, I could happily eat this, at breakfast. What a wonderful combination. Thanks for linking it to MMM. You are causing many people to have happier lives with such a recipe. o my good golly gosh a cookie for breakfast. You're my hero. Cookies for breakfast? Yes, Please! They sound great...thanks for sharing them with the hearth and soul hop this week! Oh these look amazing. I can't wait to try them...yummy! 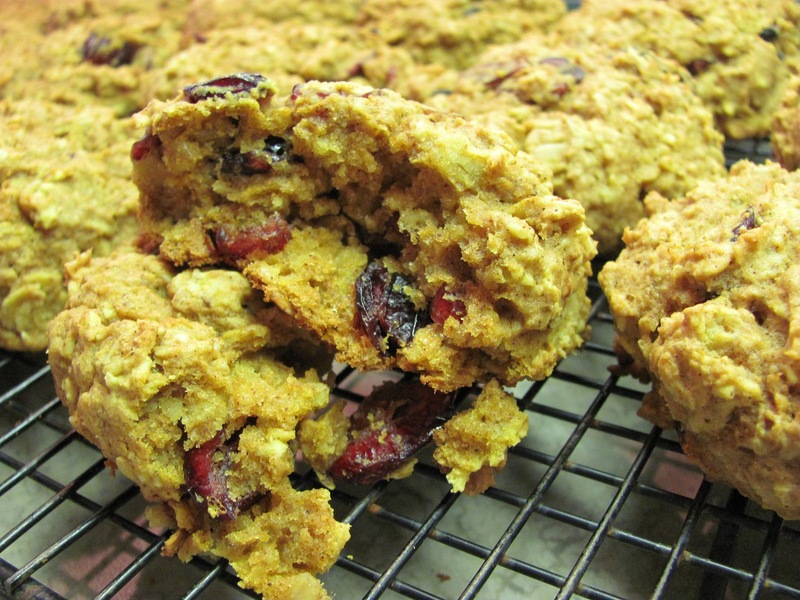 Breakfast cookies are so fun, I love that this one is pumpkin! Cookies for Breakfast what could be better! Thanks for sharing this with us. Delicious, healthy and a cookie - so it is a grab and go meal - perfect in my book! Thanks for sharing this with us at the Hearth and Soul Hop! Oh, these sound delicious! I made a cookie similar to this a couple weeks ago, with dried cherries, but I think the cranberries would be great too! Yum! I really like the sound of this recipe -- thanks! I love the sound of these, and it's wonderful they've got such wholesome ingredients too! What a great way to be able to have dessert for breakfast and still feel good about it. Have you ever made these without the pumpkin? My son would love the pumpkin but my daughter I think would like the plain oatmeal version. Yummy! This is a great recipe. I look forward to trying it out. Thanks for linking up and sharing. Man, I can't wait to make these! What a great anytime snack and so perfect for Fall. I don't have any dried cranberries, but I do have some fresh ones down in the freezer. I wonder how they'll work? I actually have a bag thawed in the refrigerator that I need to use up. I may just whip a batch of these up today. Thanks for linking to Midnight Maniac Meatless Mondays! Yummy! Love the fruit chunks on your cookies. I should probably try this recipe and share with my health conscious friends. This one is already to my recipe try out list. Thanks for sharing this one. I think cranberries and pumpkin combination is perfect.